This discovery provides firm evidence of oxygen in the very early Universe, only 700 million years after the Big Bang. 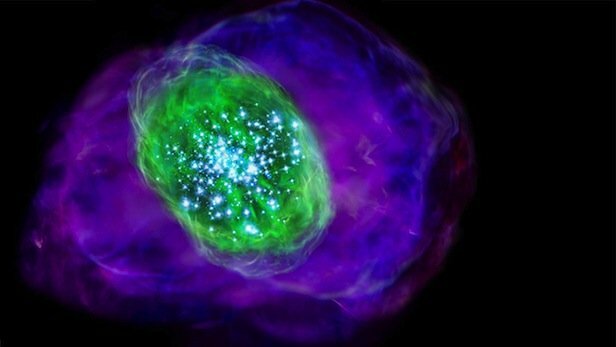 Astronomers from Japan using the Atacama Large Millimeter/submillimeter Array (ALMA) have detected oxygen in SXDF-NB1006-2, a galaxy located 13.1 billion light years away from us. This is the most distant detection of oxygen ever achieved and is firm evidence of oxygen in the very early Universe, only 700 million years after the Big Bang. The discovery, published in the journal Science, is a key step to understand the enigmatic ‘cosmic reionization’ in the early history of the Universe. Various elements are found around us in the present Universe, but just after the Big Bang 13.8 billion years ago only the lightest elements—hydrogen, helium and lithium—existed. Heavier elements, such as carbon and oxygen, accumulated in the Universe over time with the formation of stars. Before the first celestial objects formed, the Universe was filled with electrically neutral gas. A number of young giant stars emitted strong radiation and started to ionize the neutral gas, in a process known as cosmic reionization. The team estimated that the abundance of oxygen in SXDF-NB1006-2 is ten times smaller than that observed in the Sun, corresponding with their calculations. They also discovered a very small amount of dust in the galaxy, which was unexpected. The deficits of dust and carbon in the galaxy are crucially important for cosmic reionization to occur; they enable intense ionizing light to escape and ionize vast amounts of gas outside the galaxy. Source: National Institutes of Natural Sciences; Photo: S. Chon/University of Tokyo. Disclaimer: This article does not necessarily reflect the views of AsianScientist or its staff.